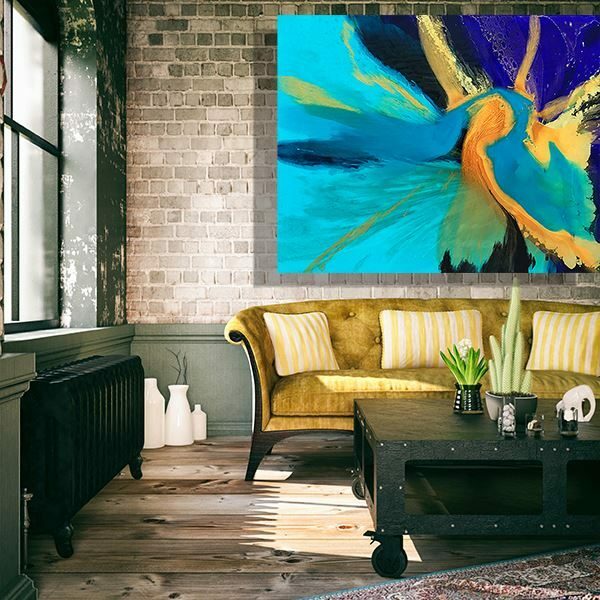 Vivid pops of electric, Mediterranean blues and golds are captured in the large-scale resin painting: ’24 Karat Gold’ by artist Jessica Skye Baker. This is a composition that will be the focal point in any room where it is hung. Resin artist Jessica Skye Baker’s ’24 Karat Gold’ is a statement-making abstract painting. 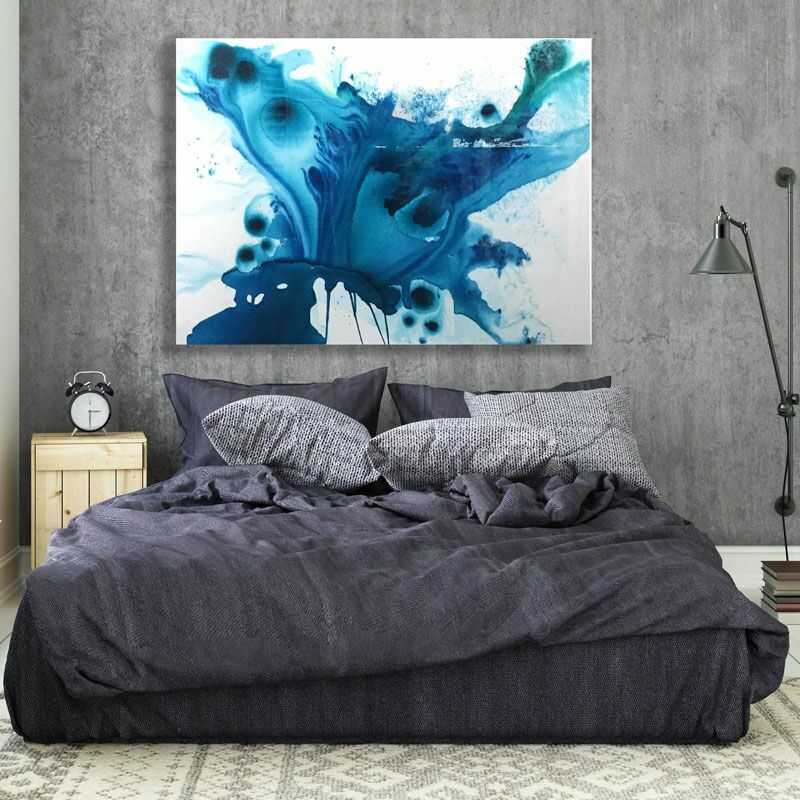 This artwork would complement contemporary, modern, and industrial spaces. It would look just as stylish in a newly renovated home. ’24 Karat Gold’ will add a sense of luxury to a room and highlight residential or business expanses such as polished concrete, timber or carpeted floors. It will integrate seamlessly onto white walls or painted feature walls. This original resin painting can be paired with a banker’s desk, Chesterfield couch or marble reception area. In a commercial space with strong architecturally designed lines, the size of ’24 Karat Gold’ would pack a powerful punch. In a home, the artwork impact could be subdued and softened with appropriate furnishings: cushions, throws, and rugs to accent its colour. Resin artist Jessica Skye Baker has been painting for decades. She found her medium at a young age and has been perfecting and honing her skill for years. Jessica is considered one of the originators of Australian resin art. She has, to date, sold hundreds of artworks worldwide. 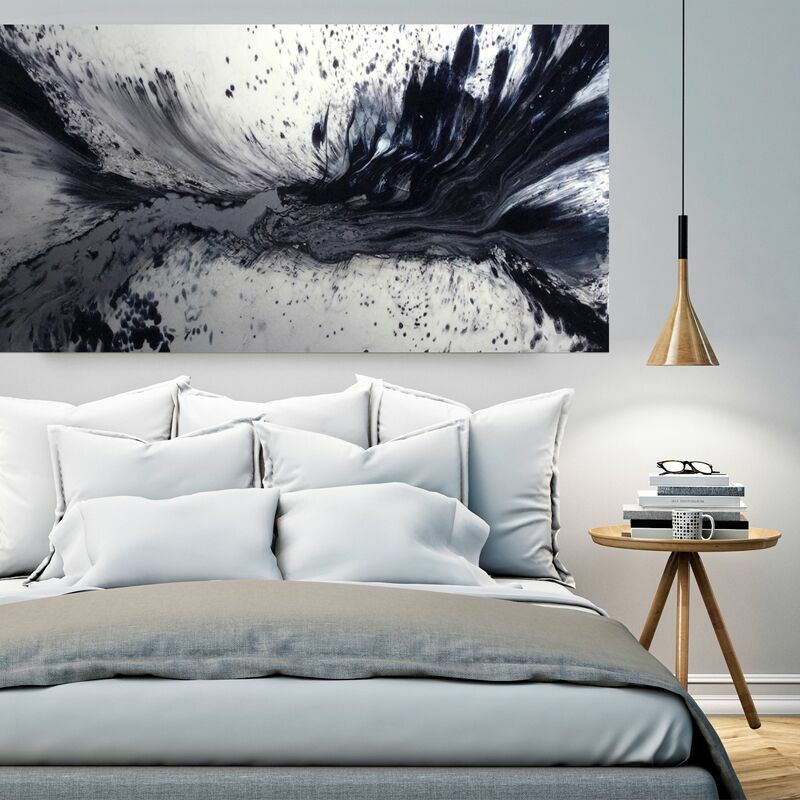 Her resin paintings hang in homes, hotels, and interior design stores. Currently, she works out of a permanent studio, open to the public, outside Melbourne, Australia. 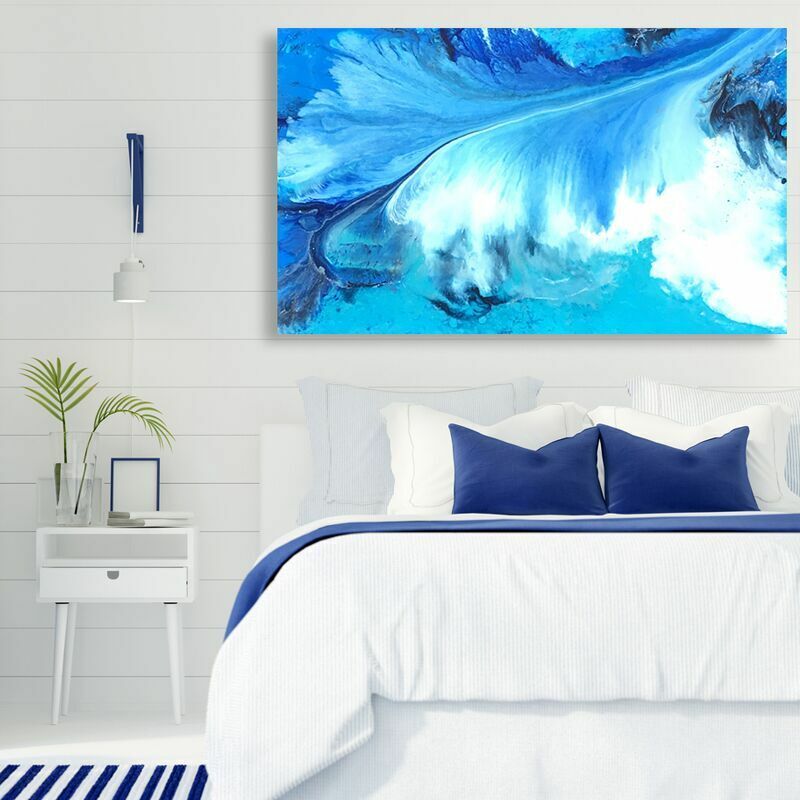 When you add a piece of original resin art to your collection by renowned artist Jessica Skye Baker, you can be confident in knowing it can never be replicated. It is solely unique. The stunning pieces can be commissioned according to the size, colour palette, and the mediums you desire. Her artwork is available online at The Block Shop, Baker Collection, and Saatchi Art. From her many years of experience with the abstract fluid medium of resin, Jessica has been able to completely embrace the art form. Each day she is able to live her passion as an artist. She has a spirited nature and paints with the same sense of will power. Firstly, she maps out her canvas size, the colour combinations she will use, and the mediums. Sometimes her work takes months to create as they are made up of individual layers of acrylic paint, inks, pigment, and resin. ’24 Karat Gold’ was created in such a way. The electrifying gold pigment was layered in acrylic paint, and then resin was poured over the entire surface. Pigments were thrown in, inks were added, and more resin was poured. The intricacy of ’24 Karat Gold’ can be seen when viewed up close. In fact, the artwork invites closer inspection. Every time a viewer looks at this painting, they will see a different dimension and aspect: pops of pigment, transparent layers, detailed lines. Resin artist Jessica Skye Baker’s huge scale paintings are captivating in size, she is renowned for not working to a small scale. She lets the mediums naturally flow off her painting surface and encompasses the motion organically into her vision. Her paintings are created with positive energy, and every piece is redolent with echoes of her creative process. What makes resin artist Jessica Skye Baker’s work so unique is that it says nothing, but somehow still says everything. Artwork is in the eye of the beholder. Is it beautiful? Does it powerfully convey something to you? Do you connect to it emotionally? As a collector and viewer, you are the one who gets to decide. The beauty of Jessica’s work doesn’t exist on its own; it is created by you, the observer. With colour and flow, the movement of a painting is a critical aspect of architectural integration for interior design. Each composition needs to have a focal point, drawing the eye with its design. It can be chosen at the centrepiece of a minimalist space or placed to enhance the accoutrements that are already present. Buying or ordering custom resin art from renowned artist Jessica Baker is a good investment. Her large abstract paintings coated with high gloss resin give her work a stained glass-like illusion. The pieces can be commissioned in your choice of stunning colours and custom-made sizes: 1 to 6 metres. Jessica concentrates on creating original artwork, as individual as a fingerprint. Obtaining one of her resin art compositions is an adrenaline rush of gleeful anticipation.